The Merkur 42C is a fabulously finished exact replica of the original, famous and much loved 1904 Gillette Safety Razor. 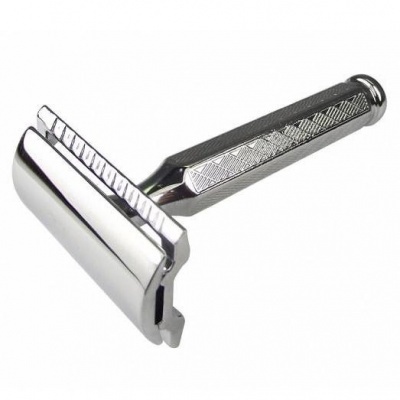 The six sided, engraved handle provides excellent grip and the overall look of this beautiful razor is Retro Cool. Great for a zero waste shave and reducing plastic consumption. Handle length 73mm, Total lentgth 78mm, Weight 70g, Handle width 5.3mm. All standard double edge replacement blades can be used with this razor. Made in Germany by quality assured Merkur of Solingen. Made of recyclable chrome-plated steel. - Takes all replacement double edge blades.